For those of you who will be in town this weekend, jazz steel drum player Victor Provost will be joining the WKP Jazz Trio for our First Saturday show at Black Fox Lounge on September 1st. 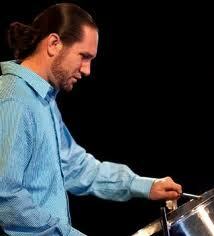 The City Paper has named Victor the best jazz percussionist. Please come out and see us! No cover. This entry was posted in Black Fox Lounge, Victor Provost, WKP Jazz Trio and tagged Black Fox Lounge, Kenny Peagler, Percy White, Victor Provost, WKP Jazz Trio. Bookmark the permalink.